Input data: Motor voltage (V L-L), Motor horsepower, Cable Temperature Rating (°C), Ambient Temperature (°C), Cable Length (ft) and Acceptable Voltage Drop (%). Calculated Values: Operating Current (A), 125% Current per NEC (A), “Zero Length” Cable Size, Acceptable Voltage Drop (V), Actual Voltage Drop (V) and Actual Voltage Drop (%). Conductor ampacities are based on NEC 2008, Table 310.16 (Not more than 3 current carrying conductors in racewary). how to calculate cable size for EOT crane’s cable. i.e. Motor KW:15, duty:S4, 150st/hr, 3 phase, 415V cable length 25 mtr(Festoon-Trailing cable) . I am confused in Three phase wire size calculation please let me know exact formula for three phase wire size calculation with multicore and single core cable. How can I use cable size for 440 kW load? Please suggest Me? Your Most Favorable Response Is Highly Appreciated. it doesnt have a calculation for 3-phase motor. Can you send me the calculation spreadsheet for ampere to Cable Size Calculations – Specified Current.with V L-L = 220V and VL-L=415V, I really need. I :-Load current =160 Amps. P :- Resistivity of copper 0.024(90 deg.C). Vd:- Voltage drop in 3 ph.=19volts. Apply formula for calculate the area of cable. Note:- 2 for single phase. Above said formula is perfectly correct. I have a one dought in apply the cable sizing formula .How u put Resistivity of copper 0.024 and this value 1.732 . If u have a any formula for that value please reply sir . USE ABOVE SAID FORMULA FOR CALCULATE THE SIZE OF CABLE BY EASY WAY. How you calculate voltage drop? I have a one doupt in apply the cable sizing formula .How u put conductivity and voltage drop value . If u have a any formula for that value please reply sir . Thank you very much. It will be tremendously useful for my further activity. Once again, thanks a lot and all the best to all of you, guys ! 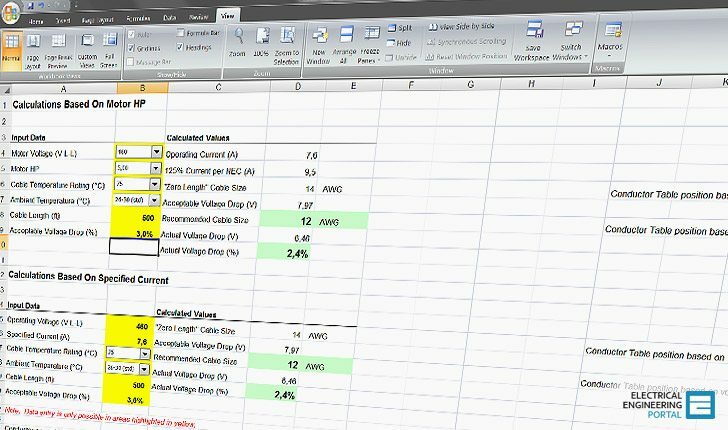 Can you send me the calculation spreadsheet for Cable Size Calculations – Based On Motor Horse Power HP and Specified Current.with V L-L = 380V and VL-L=660V, I really need. I found this one of the most useful site for new and experienced enginner. Thank you verymuch for your efforts and interest. Sharing of knowledge is always good. My security software found the following application with an exploit virus: Cable Size Calculations – Based On Motor Horse Power HP and Specified Current. Please test it and post again. It’s not virus for sure. Your security software is overreacting :) This spreadsheet as well as all the others contains VBA (visual basic for applications) part within itself that does the calculation. I am an electrical power engineer. EEP is the only place I feel comfortable in. I am really impressed by all the hard work that the whole team go through. I promise to start writing here about Renewable Energies – soon. Thank you all!